Above: An array of Sarcastic fringehead bones, clockwise from lower right, vertebrae, articular, hyomandibular, dentary, palatine, vomer, and premaxilla. Scale is a Canadian dime. Above: Sarcastic fringehead L. premaxilla and atlas vertebra. Scale is a Canadian dime. 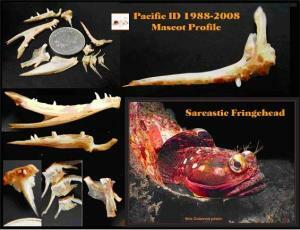 In 2006, we decided to make the Sarcastic fringehead, Neoclinus blanchardi, the official mascot of Pacific ID. Contrary to the belief held by some of our clients and colleagues - that we prefer our animals dead and denuded – the practical difficulties of keeping a cold-water marine fish are what precluded a “mascot-as-pet” scenario (although this also saved us associated sweater-knitting chores). Milton received Susan’s desperate plea (can we seriously call it anything less than that?) for a Sarcastic fringehead specimen via a cascade of contacts initiated by Carl Schilt (thanks again Carl!). Within a year (missing a pre-Christmas delivery by only a few days), a frozen Sarcastic fringehead carcass arrived on our doorstep. “Carcass” is perhaps a bit of a misnomer, since this specimen measured a mere 19.5 cm (7.7 in), a bit over half the maximum size attained by this species (about 30cm or 12 in), although still a lovely example of its kind. The specimen was promptly rendered down to bone for addition into the comparative skeletal collection of the Anthropology Dept. at the University of Victoria (so in reality, this was not a gift to Pacific ID but a gift to the Department and the University). We at Pacific ID are thrilled to see such valuable additions to the UVic collection because they increase its usefulness for our own work and enhance its value for countless other researchers. Photos of Sarcastic fringehead bones took centre stage at Pacific ID’s 20th anniversary party in 2008. As photos of some Sarcastic fringehead mouth parts attest (above right), fringeheads really do have big mouths - at least compared to a Redstripe rockfish (Sebastes proriger) of the same size.